Most of the country is still enjoying summer vacation, but here in Nashville the school year begins the first week of August – no lie. This will be the first fall in many years that I am not starting a new school year as a teacher, although I am still vicariously experiencing it as a parent. Forgive me if I wax nostalgic. For all of my teaching career – save for 2008 – 2011 when I ran the piano studio at Nashville School of the Arts and simultaneously directed Music City Youth Orchestra – I was in some part, often for the most part, a singing teacher. And so it is natural for my thoughts to turn, at this time of year, to the wonders of solfège. For so many years, the use of this invaluable tool, the practice of this incomparable method was a staple of my daily life. How many thousands of hours have I spent solfèging songs or vocal parts, or teaching students to do so, or doing it with them? How could I have done my work without it? Oh thou noble art. You can blame my redoubtable colleague Kurt Knecht over at MusicSpoke for reminding me that I wanted to write about this topic. Kurt posted the lovely story How solfeggio saved my life last week which spurred me on. It doesn’t matter if you call it solfège, or if you drop the accent and just call it solfege, or if you prefer solfeggio. It’s still the same, ancient, hallowed way. Oh music teachers, do not neglect the practice of solfège with your students any longer if you have not already learned to follow the way. Oh students, do not resist immersing yourself in its joys and sorrows. For the last four years 2011 – 2014, when I was the choir director at NSA, I began every year with the choirs by reviewing in detail the solfège system which we used in the choir program (moveable do, la-based minor), including a brief review of the history of solfège as well as descriptions of the various systems in use, and a complete review of the syllables used to sing all the scales we would practice in classes throughout the year. I used the same PowerPoint presentation to structure this review every year, and I did it with every choir. Former students, no doubt, have already noticed and remembered the opening slide from this PowerPoint that I am using as the title graphic for this post – likely it was nostalgia for my annual solfège lecture that lured them to this webpage. I did not learn solfège in school. Although I sang in choirs from childhood into adulthood, somehow I never found myself singing with teachers or under directors who were themselves initiates, and the universities I attended did not require it or offer it at the time (the 1980s). 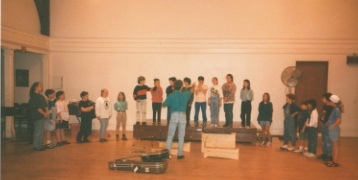 It was only when I began teaching at Blue Rock School in 1991 – and was assigned the task of designing the ideal vocal and instrumental music program for a small elementary school – that I took my first steps down the solfège path. I read many books and attended some workshops in both Kodály and Dalcroze methods that year (luckily Blue Rock is close to New York City, where such events are easily found and attended), and soon found myself marking up each song I chose to bring to my students and learning to sing it myself on syllables before introducing it to a class. Over the years I taught music at every grade level K-12, and in nearly every class and ensemble format except band. Perhaps the strongest over-arching goal I had for my work at each school – what I wished every child who went through my programs to attain – was music literacy. To me, music literacy consists of two things: the ability to read and write music notation, and a working knowledge of music literature. I found solfège to be an ideal and malleable tool for every grade level, not only enabling my students to become proficient at reading notation and understanding music theory, but (for singers) for refining pitch accuracy, intonation, and vowel placement. It is easily adaptable to the (often on the spot) creation of exercises to address specific technical issues in a simple system easily understood by students. What my solfège practice did for me and my students – beyond any other techniques that are part of my teaching and learning arsenal – was help us to develop the ability to look at a piece of written music notation and, reading it, hear it sound in the mind. The ability to hear and comprehend music when there is no sound physically present – audiation – is what pioneering American music educator Edwin Gordon calls the foundation of musicianship. Audiation has become a sort of “buzzword” in music education circles for the last couple of decades, to the extent that nobody questions the importance that the acquisition of this ability holds for the training of musicians. It follows that the ability to audiate from written notation is essential for the literate musician. Solfège is the bridge between student and notation, a concrete method to build the comprehension that translates symbols into sounds, and ultimately to develop audiation of what one reads on the page. I am not an advocate for a specific music education methodology – except perhaps for the use of solfège. I have learned a tremendous amount from the books I have read, classes and workshops I have attended, and interactions I have had over the years with those who are – whether representatives of the teaching of Kodály, Orff, Dalcroze, Gordon…but in the end preferred to find my own path as a teacher that evolved concurrently with my work as an artist. My approach to teaching would most likely be termed “eclectic” by pedagogues. I used solfège differently in my classes depending on whether I was teaching general music or choir, and depending on the age, grade level, and accomplishment level of the students involved. But the general idea was the same. Music to be learned (e.g. a song, a choral piece) was taught by first singing the pitches of the melody (or choral parts) on solfège syllables, and pitch and rhythm mastered before text was introduced, as a rule. 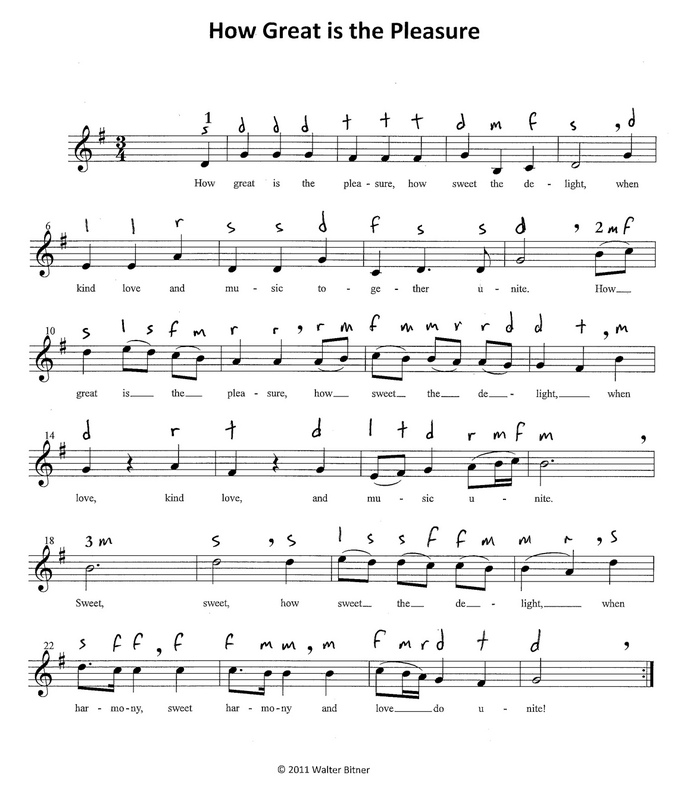 With younger children (elementary school) songs were taught first by rote (imitative call and response style) on solfège syllables with Curwen hand signs; with older children, students marked their (notated) music with solfège syllables and sang from that until the choir was ready to move on to text. The assignment of a distinct syllable to each note of the scale is called solmization, and is the basic principle of solfège. An example of a song “marked in solfège”. How Great is the Pleasure was traditionally one of the first songs students learned when they entered my program, and I taught it to nearly all my students at every grade level. By isolating the musical content from the words, students are forced to pay closer attention to the precision with which they execute pitch and rhythm. I believe this is especially important with younger children whose imaginations are more easily taken by the imagery or stories in the song literature, and may therefore pay more attention to these aspects of a song that are evoked by the words, thus neglecting pitch and rhythmic accuracy and good intonation. Combined with the other aspects of my programs, the daily application of solfège practice resulted in the overwhelming majority of my students at every grade level learning how to read music at or significantly above a developmentally appropriate level of accomplishment within a few years. I believe that the consistent association of each interval with specific syllable relationships (e.g. ascending do-fa is always a perfect fourth, as are ascending re-sol, mi-la, etc.) over time (i.e. repetition = practice) creates a set of patterns in the mind and ear of the musician that eventually transfer to recognition of the way these sound directly from the notes. In effect, the system applied consistently will teach your students to read the notes – well the pitches anyway. Rhythm solfège is another story, for another post! Parts 2 and 3 of this series will present the material I described above that I presented to my students at this time every year, in a format accessible and (I hope) of use to both teachers and students. 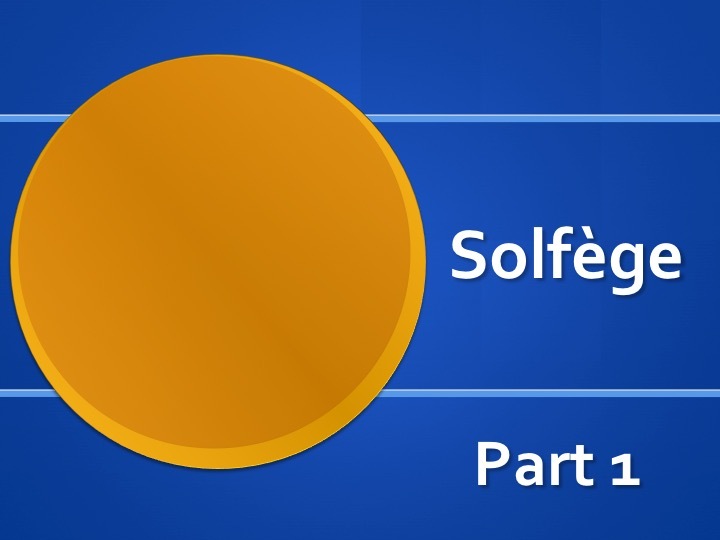 Part 2 is a brief review of the origins of solfège and its varieties of application in different systems and different parts of the world, while Part 3 consists of a description of how my students and I used solfège in class each day. Part 4 is an epilogue describing a few solfège exercises and anecdotes from my experience using solfège in the classroom. This article appeared in the October 2017 issue of Choral Director magazine. The Joy of Solfège was published on the website of the National Association for Music Education here on December 5, 2017. By walterbitner in Choral, Education, Music Education, Pedagogy, Solfège on August 11, 2015 . Looking forward to Parts 2 & 3.